Thankfully, Brighton is different. Brighton is in a league of its own. As soon as the train pulls into the beautifully maintained station you know that this is not Margate, or Blackpool or Scunthorpe. People carry smart leather weekend bags, not six-packs of Skol Super. Brighton’s proximity to London via the high speed rail link, natural charm and enduring appeal for both gay and straight fun-seekers have helped ensure that it has not crumbled towards ruin. This is not to say that Brighton feels overly slick or moneyed. There is a wonderful sense of broken-down, louche gentility about the place. It’s a town that does artfully dishevelled very well. The finest hotel in Brighton for those with vinous or gastronomic inclinations is the Hotel du Vin on the corner of Ship Street in The Lanes conservation area. The Hotel du Vin group is a British hotel company that offers visitors excellent accommodation in interesting venues around the UK. The hotels are generally developed out of beautiful old buildings to great effect. Brighton’s outpost (one of the finest of the group), is a wonderfully rambling site which was once a seaside coaching inn, just moments from the seafront. 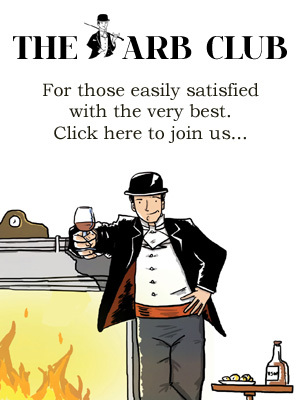 As the name suggests, wine plays a major part in the proceedings at the Hotel du Vin. We arrive and are led to the Pol Roger room where we will be residing for the weekend. Each of the hotel’s forty-nine bedrooms and suites takes the moniker of an iconic wine. The room is minimal and elegant and enjoys a view that looks out toward Brighton’s famous pier. The bed is huge and the journey has left us fatigued, so a snooze seems appropriate. Evening brings a strange, green luminescence to our room. The street lights flood the hotel and we realise it’s time to assess the restaurant. The Bistro du Vin is central to the hotel’s appeal and offers one of the finest dining experiences in Brighton and certainly the best wine list. The tone is simple, gutsy modern British, with a clear Gallic flavour. Essentially, this is food to accompany wine rather than the other way around. I choose buttery potted crab whilst my guest enjoys a richly-flavoured, deep brown onion soup – a good text for the kitchen. For a main course there’s a special of Chateaubriand cut for two. The Scotch beef is well-cooked, and ruggedly flavoursome, it makes a superb partner for one of Chapoutier’s burly northern Rhone reds. The meat is served on a rugged wooden platter with fat, triple-cooked chips and a classic salad – this is food for those with robust tastes. Afterwards we retire to the sultry leather sofas in the lounge and drink Negronis whilst playing scrabble which feels decadently highbrow and entirely appropriate. Morning comes fresh and bright through the windows, with the salty tang of the seaside and gulls wheeling overhead. We get up slowly, enjoy lengthy showers in the hotel’s huge stainless steel wet room of a shower and then stumble down and out into the morning. After a bracing dash along the beach, we weave our way through the Lanes to have oysters at my favourite oyster bar in the world. 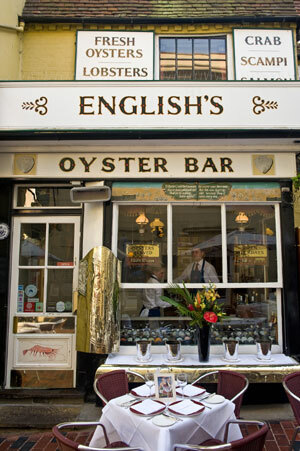 English’s of Brighton is a restaurant of inimitable charm and understated, frayed-at-the-edges glamour. The restaurant has been in the ownership of the Leigh-Jones family since 1945 and as you slip through the door into the oyster bar there is a palpable sense of the generations of gourmands who have enjoyed its fine cuisine. 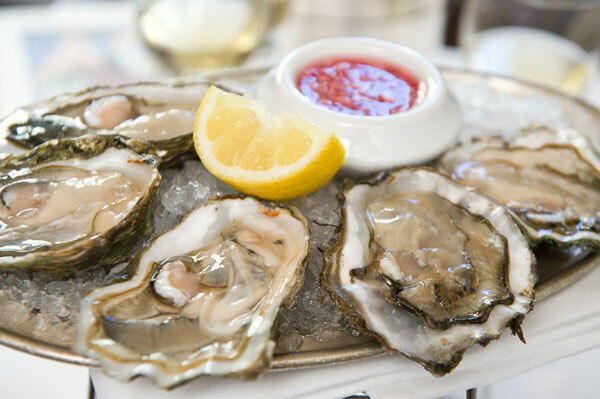 The restaurant is an old-school seafood specialist, but for me it is always about the oysters. The lobster is superb, the Dover Sole flawless, but it is for those briny bivalves that I return again and again. We come in from the cold and take our places at the marbled-topped bar. Old theatre posters line the walls along with works of art and ancient bottles of cognac. We order huge platters and Blanc de Blancs champagne. Rock oysters from Scotland, huge, meaty natives from West Mersea Island and twelve Irish Carlingford Lough Irish rocks for good measure. A feast ensues, pre-historic looking shells pile higher and higher, there’s champagne and laughter and slurping. It’s perfect. Go to Brighton; Brighton flies the flag for decency in an otherwise depressing soup of broken seasides. Sleep in style at the Hotel du Vin, take the breeze on your face and then retire to English’s a revel in manifold pleasures. This is the English seaside as it should be: elegant, fresh and charming. English’s of Brighton 29-31 East Street, Brighton, BN1 1HL. Tel: 01273 327 980. Website.